The Top Panel diagrams accessible via the links on my Valvetronix AD30VT Amp Model Presets web page can be easily made with the Microsoft Paint utility, though any of a number image editing programs will do the job just as well. The key is having a set of pre-made Top Panel image files from which the finished diagram can be quickly and easily copy/pasted together. Fortunately, Duh Voodoo Man has already done the hard work for you by creating these image files, which can be downloaded from THIS LINK. If you can't get the ZIP file to download by just clicking the link, try right-clicking on the link and selecting "Save Target As..." from the dropdown menu. NEW ADDITION! 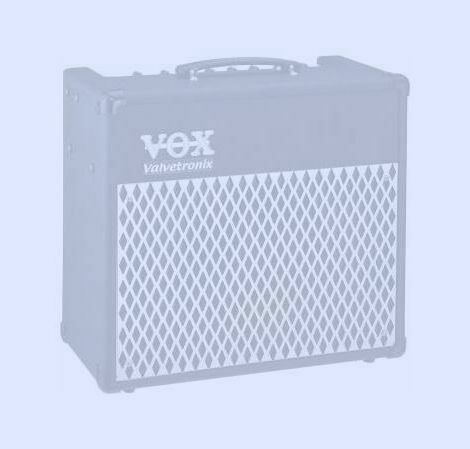 Analogous image files for the AD60/120VT series of VOX Valvetronix amps are now included, too! For the pre-drawn amp preset selector and effects/pedal selector knobs, I've included images for all possible preset positions. For the remaining knobs, I've used the "clock position" approach for creating the images, e.g. a knob set at the 10 o'clock position, or the 3 o'clock position, etc. The available choices correspond to all of the "half-hour" increments of the clock over the selectable 7:00 to 5:00 range of these knobs (7:00, 7:30, 8:00, 8:30, etc.) It's these pre-drawn versions that you'll find most useful in creating your Top Panel diagrams, but the blank images are included in case you need them. The ZIP archive has these images pre-organized into a subfolder structure. Just unzip the contents to a folder location of your choice. Open the blank Top Panel diagram (TP_BLANK.BMP or 60-120_TP_BLANK.BMP) in MS Paint and then just use the "Paste From..." option at the bottom of the Edit menu to pull in copies of the images you wish to use for the panel diagram you're making. Navigate to the folder where you unzipped the image files, locate and select the image to be pasted, and then click on the "Open" button. This will paste the image into the upper left corner of the open Top Panel image, but this pasted image can then be dragged and dropped wherever you want it on the Top Panel image. Just drop it over the blank knob image you want to replace. Repeat this process for all the knob settings you wish to specify on your Top Panel image. Finally, use the Text tool in Paint to label the diagram in the "Program Name" box at the top of the panel image. All that's left to do is to save the completed image file with the name of your choice. I recommend saving it in the GIF image format, since this maintains good image quality while giving a small file size. While the graphical depiction of the Top Panel settings will appeal to many people, some of you may prefer a text table approach to summarize your programs. For those of you who might find this useful and who have access to MS EXCEL, I've created a spreadsheet for storing program settings. Because it uses dropdown selection lists very extensively, very little actual typing is required. It also contains a table listing all of the preset amp model settings, plus instructions on how to use the spreadsheet. Click on THIS LINK to download this handy tool for the AD15/30/50/100VT series amps. And we didn't forget you AD60/120VT series amp owners, either! Thanks to the efforts of "deg0ey" at the Patchtronix.com forum, you can get a spreadsheet to store all your program settings for those models HERE. Click HERE to return to the Top Panel links page.